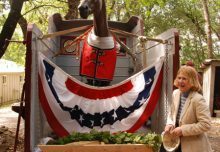 Pam Berg, who single-handedly runs a ranch in Northern California that is home to 28 retired racehorses and also works full-time as a racing steward, has been awarded the 2004 Dogwood Dominion Award, Dogwood Stable president W. Cothran “Cot” Campbell announced July 6. Berg, the 12th recipient of the annual award to honor an “unsung hero” in racing, will receive $5,000 and a bronze statue of Dominion at an Aug. 4 luncheon at the Reading Room in Saratoga Springs, N.Y. She was selected from 54 nominations by judges Anne Campbell, Penny Chenery, and Jerry Bailey. 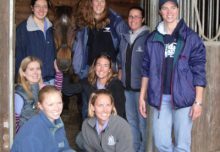 In 1995, Berg founded the Glen Ellen Vocational Academy (GEVA), an 8 1/2-acre ranch. 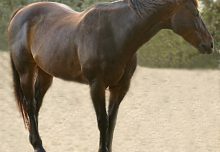 For the most part with her own labor and financial resources, Berg looks after horses that could have ended up at a slaughterhouse. The award was inspired by the multiple stakes winner Dominion, who was campaigned by Dogwood in the 1970s and went on to become five-time champion sire in England. It was created upon his death in 1993 to recognize the “unsung heroes” in the racing industry. Former winners are H. W. “Salty” Roberts, Howard “Gelo” Hall, Peggy Sprinkles, Grace Belcuore, Nick Caras, Donald “Peanut Butter” Brown, Daniel Perlsweig, Katherine Todd Smith, Julian “Buck” Wheat, Jim Greene and Shirley Edwards, and Neftali “Junior” Gutierrez. Past honorees, friends, and family of the 2004 winner, as well as various racing enthusiasts and industry leaders, will attend the Dogwood-sponsored luncheon.